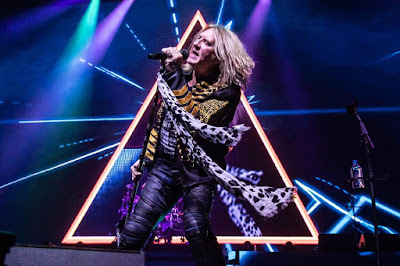 Def Leppard are streaming a video recap of the 2018 leg of their Hysteria + More tour of the UK and Ireland, which saw the band play their legendary 1987 album in its entirety. Produced by Mutt Lange, “Hysteria” reached No. 1 in the band’s native UK and the US, where it went on to achieve Diamond status for sales of more than 10 million while selling more than 25 million copies worldwide. In sync with their fall 2018 concert dates, Def Leppard released a 10-disc limited-edition vinyl box set called "Hysteria: The Singles." The package delivers re-pressed versions of all eight seven-inch vinyl singles from the project, including the Top 5 hits "Pour Some Sugar On Me", "Animal", "Love Bites", "Hysteria", "Rocket" and "Armageddon It." Two bonus singles – "Excitable"/"Run Riot" (Album Version) and "Love And Affection"/"Don't Shoot Shotgun" (Album Version) – are exclusive to the vinyl box set. Def Leppard will be inducted into the 2019 Rock And Roll Hall Of Fame at the 34th annual ceremony in New York on March 29. Def Leppard have just announced dates for a summer tour of Canada; the three-week, 11-show series will open in Halifax, NS on July 12, with general public tickets available starting Friday, January 18 at 10am local time.